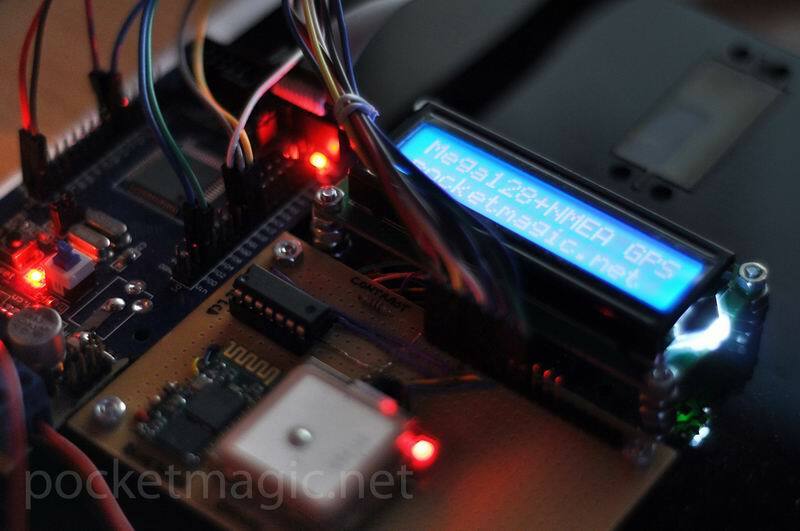 Recently I have developed a GPS NMEA Parser for an embedded system using the ATMega128 microcontroller, and decided to pack everything together as a GPS open source library for AVR Microcontrollers. The code is highly optimized to load the microprocessor as low as possible (both in terms of storage and CPU load), so the serial data is parsed as it gets in, without using redundant data structures or operations. Most GPS Modules output serial data, using the RX TX pins, and the UART protocol. The data itself is in the NMEA format, a CSV (comma separated value) format with predefined keywords. One such set of NMEA CSV values, that starts with $ and ends with EOL, is called a [b]NMEA sentence[/b]. The NMEA sentence is a comma separated list of values which contains information on a single GPS reading. There are a number of sentence types, each with its own, variable number of values, as defined by the NMEA protocol, such as the GPRMC (Recommended minimum specific GPS/Transit data) sentence, the GPGGA (Global Positioning System Fix Data) or the GPGSV (GPS Satellites in view) just to name a few. See this page for more details on the NMEA sentences. The library consists of two files, nmea.cpp and nmea.h defining a C++ class, named NMEA. 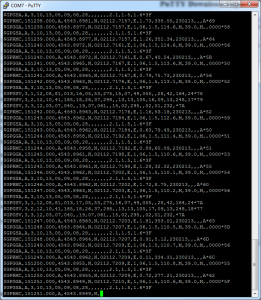 The GPS data is provided to a instance of this class (an object) using the feed function int fusedata(char c); . 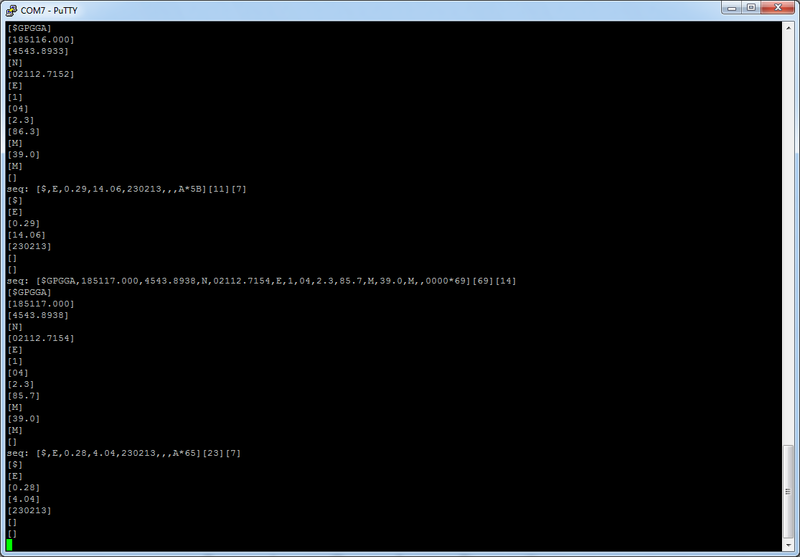 As you can see this function takes one char, and must be called each time serial data is received from the GPS module. 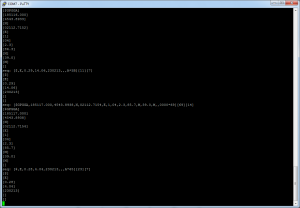 The serial data is assembled on the fly, without using any redundant buffers. When a sentence is complete (one that starts with $, ending in EOL), all processing is done on this temporary buffer that we’ve built: checksum computation, extracting sentence “words” (the CSV values), and so on. *  11   = Geoidal separation (Diff. between WGS-84 earth ellipsoid and mean sea level. The code above uses an index (i) to show more content on the tiny 2×16 LCD. 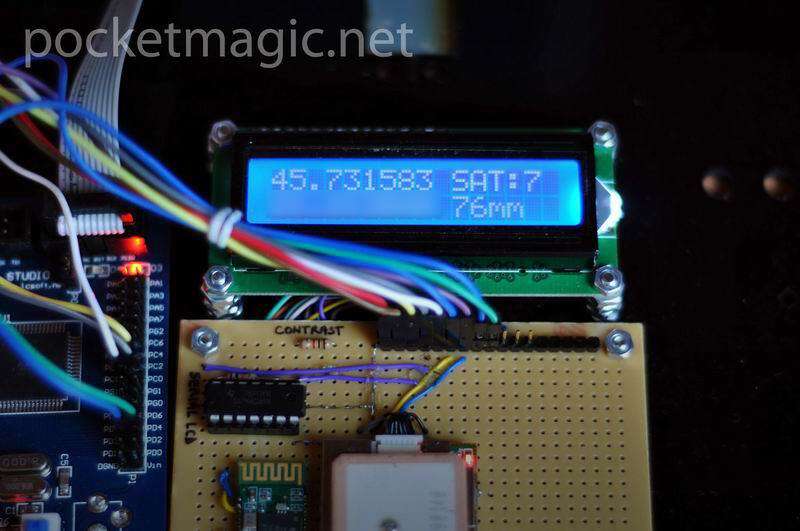 First we show latitude, number of satellites used, longitude and altitude (in meters) and on the next iteration we show speed, bearing UTC time and UTC date. 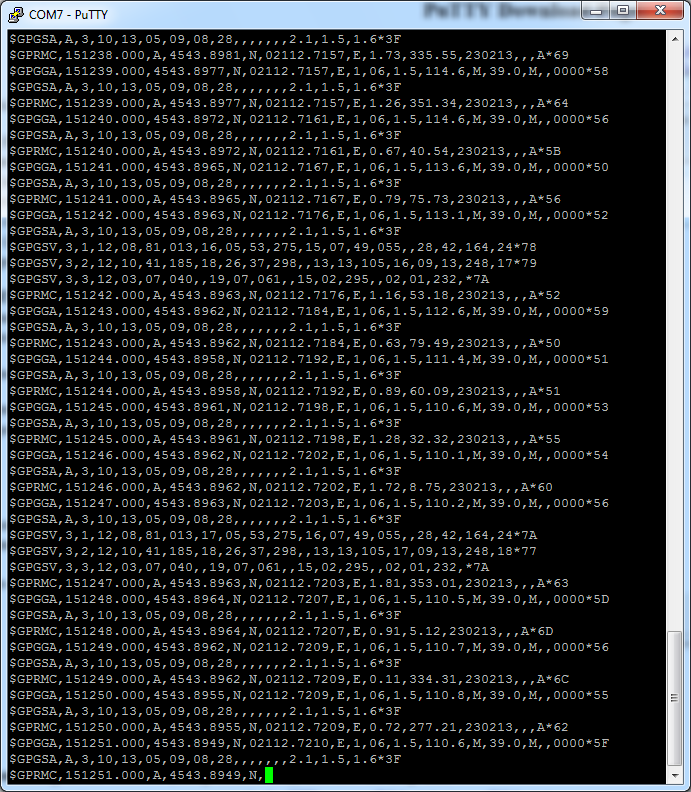 As you can see we call isdataready() function first, to make sure we have a GPS fix and valid data. The rest is straight forward, but in case you have any questions, feel free o use the comments form below. This library is free software, licensed under GPL v2; you can redistribute it and/or modify it under the terms of the GNU General Public License as published by the Free Software Foundation; either version 2 of the License, or (at your option) any later version. For other licensing options, feel free to contact me. Code available here, and on Github here. Thanks to Morteza Zafari for spotting an issue in the speed converter. It is now fixed.